Prevent dust by using two entrance mats at each entrance. One just outside the door and one just inside the door will reduce the amount of dust, dirt, and debris that enters your home. Be sure to choose mats that will hold up to the wear and tear of your traffic. Mats should also be cleaned regularly. Mats can be shaken out and vacuumed frequently. Outdoor mats may need to be hosed down and dried seasonally as well. It's a good idea to have an indoor and outdoor mat for each exterior door in the house. Check and maintain your air filters to make sure they are functioning properly. Air filters will last between 1-3 months ​but should be changed as they become clogged with dirt and debris. Besides reducing the dust in your home, changing the air filters regularly will extend the life of your air conditioning unit making it have to work less hard to cool your home. This will also reduce your energy bills as well. An added benefit is overall better air quality in your home. Brush your pets often to reduce shedding from your favorite pet. Pet owners will see that much of their dust and debris can come from their pets. Brushing not only gives you quality time with your pet but reduces the amount of dander and shedding that you end up dusting away. A regularly bathing routine is also a necessity to reduce pet dander. Be sure to wash pet bedding frequently and to clean pet areas often. By keeping windows closed, you'll prevent dust and debris from blowing into your home. At least once a year, it is a good idea to double check your window and door weatherstripping to make sure it is still functioning properly. Replace old or ineffective weatherstripping to improve the seals on your windows and doors. There are a ton of dusting products on the market, but each one has its own set of pros and cons. 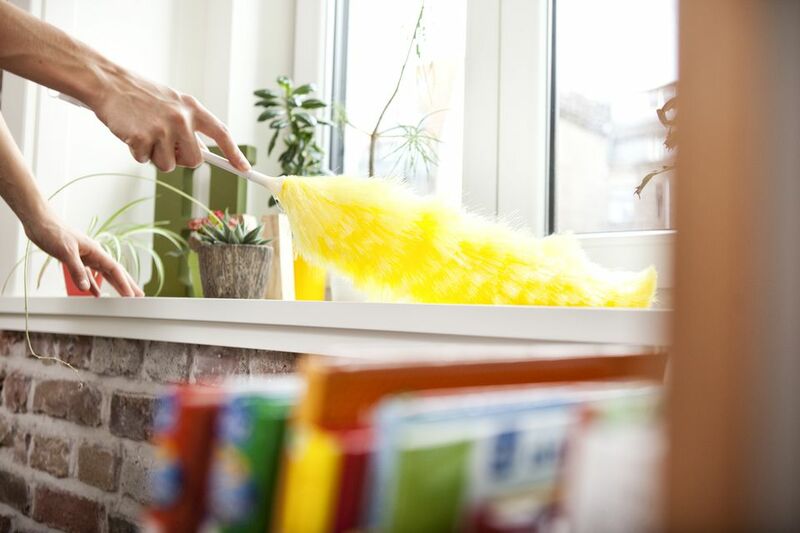 Use the right dusting tool for your jobs. Microfiber cloths work well because they trap even tiny particles of dust. Lambswool and electrostatic dusters are popular for this same reason. Many people prefer to use their vacuum cleaner to dust since all the particles get sucked away into the vacuum cleaner. Using slipcovers on your upholstery allows you to shake out a slipcover as opposed to trying to vacuum dust from an entire sofa. As an added benefit, your furniture will be protected from accidental spills. Be sure to look for a slipcover that has easy care instructions that you can handle easily. If you use a furniture oil or polish, be sure to follow the directions and don't overuse the product. Overuse or improper use can lead to a buildup on your furniture or clouding of the wood surfaces. Using a dry microfiber cloth will pick up more dust and keep your furniture from becoming clouded or built-up with oily substances. Dusting is a great time to repair any new scratches you may notice on your wood furniture. Use a furniture marker or crayon to go over scratches when you dust. This is a great time to remove candle wax, burn stains, or adhesive stains from your furniture as well. Used fabric softener sheets can be used to dust as a substitute for more expensive electrostatic cloths. Dust from top to bottom to prevent going over surfaces more than once. Sometimes you may need to wet dust after you dry dust, but always dry dust first. Be careful about allowing even a small amount of water on wood surfaces because they may stain, warp, or become damaged.